In today’s post, senior editor J. T. Roane interviews Niya Bates, a native of Charlottesville, Virginia and a two-time graduate of the University of Virginia with degrees in Architectural History and African and African American Studies. She is Director of African American History at Thomas Jefferson’s Monticello, where she leads the Getting Word African American Oral History Project. 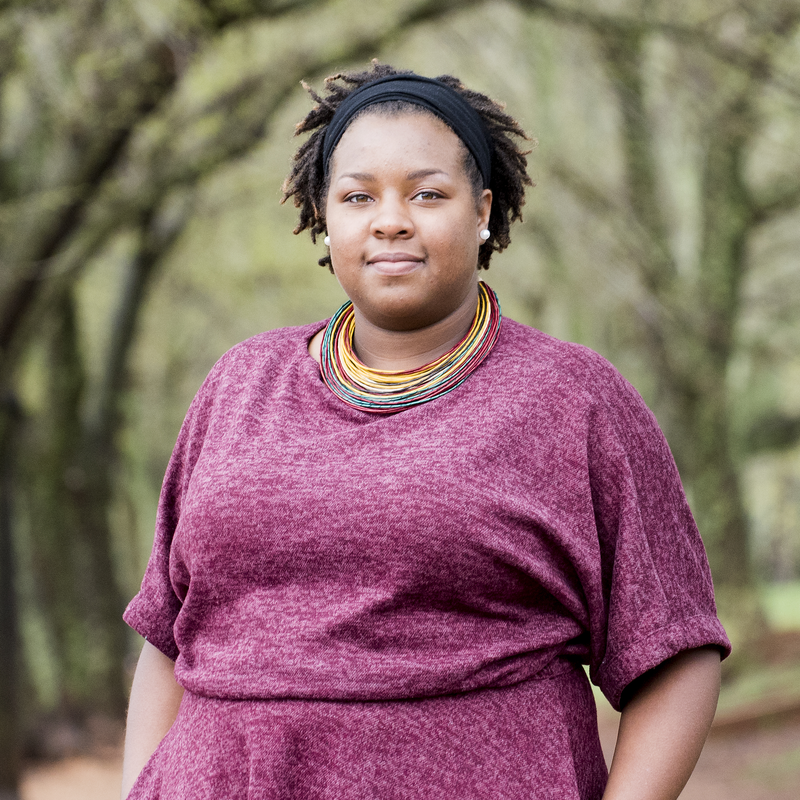 As a public historian at Monticello, Niya is responsible for engaging local and national audiences in conversations about slavery and its legacies. She aided in the development of several new exhibitions at Monticello including “Getting Word” and “The Life of Sally Hemings” and is leading efforts to memorialize Monticello’s enslaved community. Her research focuses on race, cultural landscapes, slavery and freedom. She is currently serving on the boards of Preservation Piedmont and the Jefferson School African American Heritage Center. She is a member of the President’s Commission on UVA in the Age of Segregation and an advisor for the UVA Landscapes Studies. In 2017, she published an article titled “Race and Architectural History: An Appeal” in Arris: Journal of the Southeast Chapter of the Society of Architectural Historians. Follow her on twitter @undeNIYAable. J.T. Roane: Tell us more about your public history work at Monticello and in Charlottesville and Albemarle County, Virginia. Niya Bates: I’ve been working at Monticello, a plantation museum and the home of Thomas Jefferson since 2016. At Monticello, I lead a project called the Getting Word African American Oral History Project, where we’ve spent the last 26 years collecting oral histories from over 200 direct descendants of people who were enslaved by Thomas Jefferson – including the Hemings and a dozen or so other families. And since Millennials love side hustles, I also work in the Charlottesville and Albemarle communities to preserve Black history through national register nominations, oral history, and the usual tricks and trades of public history. Right now, I’m working on a project with the Jefferson School African American Heritage Center, which was Charlottesville’s first Black high school, on a project to identify the origins of Charlottesville’s Black community. Because there was never a “great migration” to Charlottesville, our hypothesis is that the current Black community has deep connections to former plantations in Albemarle and surrounding counties and that they should be celebrated for their contributions to local history. One of the things that really excites me about this work is its power and capacity to reconnect people and families with their ancestors. It can begin to repair some of the relationships that were broken by slavery, racial violence, and other forces that resulted in forced migrations in Atlantic history. So often in our culture we look toward our roots to anchor and inform who we are. Without this work, that rediscovery process would not be possible for many Black Americans who descend from enslaved people. Roane: How did you come to this work? Bates: While I’d like to say that I always knew I would become a historian, a class fieldtrip to a local plantation my junior year of college ignited my passion for pursuing Black history in all its forms. I should preface this story with the fact that I attended college at the University of Virginia and Charlottesville, VA is my home town. I was taking a class called “Art and Culture of the Slave South” where we learned about the material culture of slavery – the architecture, décor, everyday goods bought and used by enslaved people, and everything else one would expect to learn in a class like that. For one of our fieldtrips, we visited Cloverfields Farm, a former plantation that is less than five minutes from my grandparents’ house. I grew up driving past it when we went to visit, but I had only heard vague stories about it. During the trip, we toured the property learning about timber frame and log construction, daily life for enslaved people, and plantation management. After walking around outside, we entered the basement of the big house where the woman leading our tour, a descendant of the original owners, took us into the kitchen. The first thing that I noticed inside, behind the door we walked through to get into the kitchen, was a large collage of photos of people who had worked there from the 1940s-1970s. In the middle, I saw an old photograph of my aunt dressed in a domestic worker’s uniform. The next photo I saw was of a cousin and then one of another relative. There we were— two descendants of that place, classmates who probably hadn’t even registered what was happening, and a professor in shock. I will never forget that moment. That field trip made me wonder how much I really knew of my own family’s history. But beyond that, it made me consider what my public education was lacking. It was absurd that I could live near so many former plantations, but not actually know anything about them or the people who supported them well into the twentieth century. I also began to consider how public landmarks excluded Black history, especially since there was no mention of African American people on the historic markers for many of those places. From there, I became interested in understanding cultural landscapes rooted in place and space. It isn’t all that surprising that I’ve worked at two presidential house museums, both places deeply engaged with their descendant communities and grappling with what it looks like to interpret “multivocal publics” – defined by Andrea Roberts as spaces that are historically significant to different constituencies for different reasons. Taking that into consideration, how do we as a culture and a nation challenge our understanding of the founding era of the U.S. and its participants? It’s a question I work to answer every day by studying slavery at the home of a founding father. Roane: What are some of the unique challenges of working with archives and material culture at sites of commemoration for public historians? Bates: In Charlottesville and Albemarle, public history is having a moment in the wake of white supremacist violence in August of 2017. There is renewed interest and excitement about preserving Black history and supporters are pouring resources into numerous public history projects that center the Black experience. While this energy is beneficial for Charlottesville and Albemarle in many ways, people have not taken stock of the work that the Black community has already done to preserve our own history. Community leaders have already collected countless oral histories, made documentary films, and undertaken other long-standing public history projects. This field often suffers from having some of its best work go unpublicized or be underutilized by people not closely connected to it. The result is a duplication of work that often robs projects driven by community members of the heightened attention and investments that larger institutions receive for doing the same work. This is not a unique scenario for a college town, and I remain optimistic that people will support existing projects and do more collaborative work in our area. Roane: How has your work to recover and register historic sites in the development of Charlottesville and Albemarle’s Black communities shaped how you understand history, memory, and contemporary society? Bates: My work here has shown me just how immensely important it is to get our history right. We can’t allow revisionism and myth-making to dominate our public consciousness or memory. I consider myself fortunate to be friends with Zyahna Bryant, the young activist responsible for sparking the conversation about monuments in Charlottesville and the history they represent in public spaces. Without her, I don’t think public history would be experiencing a revival in Charlottesville and Albemarle. We are now painfully aware of our critical need to define the boundaries and limitations between history and memory. Black historians, women, and young people have been critical players in reframing the narratives in Charlottesville and Albemarle. This work has become one of the clearest avenues for truth and repair in a community – and society writ large – that is trying to recover from generations of harm.